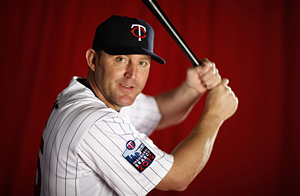 With 17 towering home runs so far in 2010 (as of August 20) and 581 to date in his 20 season MLB career, Jim Thome has muscled his way past another hard-hitting career infielder Harmon Killebrew (573) to take the 10th spot all time. Next up for “The Thomenator” is Mark “Big Mac” McGwire who retired with 583. But perhaps the more important landmark “Big Jim” has in his sights on is the 600 plateau surpassed by Alex Rodriguez on August 4. Granted Jim won’t get there as fast as A-Rod’s 8,688 at bats but then again he would be just the 8th man to cruise by the magical 600 road sign. Those who manage to keep up the pace are the rare breeds, and A-Rod is rarer than any of them. He joined the club faster than anybody in history, and by a long shot. He turned 35 on July 27. Ruth, previously the quickest to 600, was 36 years, 196 days old when he hit No. 600. Aaron was a couple months past his 37th birthday. Mays, Bonds, Sosa and Griffey were all 38. So what are the chances that the 40-year-old will crash through the 600 long ball barrier in his distinctive bull-in-a-china-shop style? Actually the odds are definitely with “Big Jim” who has averaged 28.5 homers per year over the past 3.5 years and is still going strong, According to Career Assessments, an online tool that predicts the final career total of MLB players, the “Powerhouse From Peoria” should top out at 623 career long balls. Editor’s Note: The same system predicts Alex Rodriguez will finish with 763 when all is said and done (one more than Barry Bonds – WOW!). While Manny Ramirez, who is slowing down and currently on the injury list, should peak at 605. Thome knows he'll only get there if his body cooperates and he re-ups with the Twins or finds another taker for his DH-only services next year. But it’s definitely on his mind as he continues to make opposing pitchers nervous. “You think about it," Thome admitted. "It's close ... If you play the game, and all that stuff works out, it would be wonderful to accomplish it."